Should you sell your business? This is one of the most difficult questions and there is no one right answer. I have been asked this question so many times and it is the most difficult to answer. To provide some assistance on the question, however, I will be putting together a series of posts on the factors that I find myself discussing with friends as they attempt to decide whether to sell their business or not. In general, I have a bias against selling a strong business. There just are not that many strong businesses in the world, and you are one of the lucky ones to be able to own one. People spend a lifetime trying to create a strong business or find one to buy and both of those paths are difficult. And, businesses tend to be the best place to invest capital for the long-term because of their ability to grow, to be interesting endeavors, to be engaged in making the world better, and their ability to adapt to changing circumstance of the government or the economy or other external factors. Of course, sometimes there are reasons that one must sell a business and I understand that. Absent those reasons, however, full disclosure is that I have a bias against selling a strong business. Below are some of the factors that I recommend you consider when trying to decide if or when to sell your business. One factor may outweigh everything else. Each of these will be a separate, expanded post in the coming weeks. If you are uncomfortable giving and receiving feedback, you will not reach your full potential. I am convinced that the most important skill to continuous self-improvement and to helping those around you is the ability to give and receive feedback effectively. At a lecture by Boris Groysberg of the Harvard Business School (please see link to his book below), he made a point that giving and receiving developmental feedback is the single biggest skill needed to improve organizations, grow superstars, and develop a culture of development and improvement. Boris says that “developmental cultures” are much better at producing and retaining superstars, and the key to developmental cultures is providing developmental feedback. Some tips for giving good feedback include describing skills/situations well, being specific, citing examples, and be oriented to helping them improve or problem-solve around the issues. At my massage school, the National Holistic Institute, we have posters around our campuses that remind the staff and students to “Tell the Truth with Compassion”. The idea is that we are all learning from each other and we need to be comfortable and good at giving and receiving feedback. Usually, we do this well. Occasionally, we need to get things back on track. Now, we have an interesting situation where a couple of our campuses have developed cultures where the teachers are not comfortable giving peer feedback. At most of our campuses, this is one of the most important initiatives to helping all our teachers continuously grow and improve. We have a peer review process where teachers observe other teachers to provide helpful feedback (and maybe learn a few things in observing as well). We are making a determined effort to make all teachers comfortable giving and receiving feedback, specifically at this campus. I lost huge money early in my career in not electing to switch my company from a Corporation to an S Corporation. I don’t want you to make the same mistake. Each year, the owners of C Corporations have an opportunity to switch their tax status with the IRS from C Corporation to S Corporation if they send in a simple election form by March 15. The goal of this post is just to get you thinking. Please triple-check everything and your individual circumstance with your tax advisers. As most of you know, a limited liability company (LLC) also has the advantage of being a flow-through entity for tax purposes. This post is primarily for C Corporation owners. Are you still paying two-levels of tax on the income from your business? If your company is a profitable, cash-generating business, it is a large advantage to be organized as a flow-through entity for tax purposes (S Corporation or Limited Liability Company). As most of you know, this means the company does not pay income tax at the company level. Income tax is paid only by the business owners on their individual income tax returns. 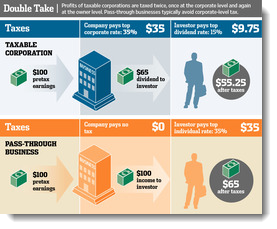 If your company is organized as a C Corporation, you pay tax at both the level of the company and again on any dividends. Unfortunately, most venture capital and private equity investment funds require their investments to be C Corporations. A rare exception is my investment partnership, Greybull Stewardship, that is structured purposely to invest in flow-through tax entities. In fact, we prefer flow-though tax entities. This is also much better for the co-owners of our portfolio companies because they can receive tax-efficient income being generated each year as well as the long-term equity value created. Many of our business co-owners prefer Greybull Stewardship for this and other reasons. This month, the Wall Street Journal wrote a nice article about the increase in flow-through tax entities in the United States. 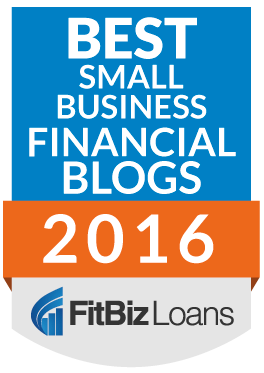 They write that over 60% of businesses with over $1 million in profit are structured as pass-through entities. 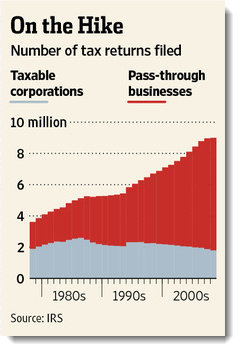 And, the WSJ writes that the percentage of U.S. corporations organized as nontaxable businesses has grown from about 24% in 1986 to about 69% as of 2008, according to the latest-available Internal Revenue Service data. “Teach what you want to learn” is a phrase that I like. For me, it captures the idea that teaching or sharing something with others helps the ideas sink into your own mind. It is with that thought that I am beginning the Mason Myers Blog. I hope that you gain some nuggets that help you in your business, but I am also hoping that it helps me clarify my thinking and deepen my understanding of things as I write about them. Please share your insights, give me feedback, and help me improve as we embark on this journey together. For that, thank you in advance!